Did you know that 45% of sick days are caused by stress? And that one in 83 teachers (3,750) are on long-term leave for stress and mental health issues*? And this stress in your school can result in sickness and lower productivity which leads to poorer exam results? We deliver no-nonsense, practical wellbeing programmes that are customised to your requirements and enable your staff to experienced greatly reduced stress, resulting in improved productivity and fewer sick days. With a stress reduction workshop for your school staff during an inset day (or at the end of the school day), they can learn to manage stress and anxiety resulting in happier staff, happier students and better exam results! For more information and to discuss your requirements, please call Darren on 07977 135506 or fill in the following form. I came into school especially for the session and I found it very interesting as I have been wanting to practice mindfulness techniques for years and have never taken the time to do anything about it. I plan to practice daily and will try one or two of the techniques on the child I work with too as I think it may well be beneficial for him. Thank you for providing the opportunity. Darren was really great. A lovely man. He shared all his knowledge well and was keen on feedback from us to make it a two-way conversation. I think, I would like to have him at home to help me develop the mindfulness skill with his calming voice and manner! Joking apart, it was very relaxing having talked us through it all. It was a lovely way to spend a Tuesday morning! This option is the best choice for helping your staff to establish their mindfulness practice and achieve long-lasting results in terms of reduced stress and improved wellbeing. This option will really help staff to manage stress by making Mindfulness part of their lives. Your staff can learn how to run Mindfulness sessions for the students, leading short sessions that can be run at the start of a class, in assembly, during lunch time or at the start of the day. 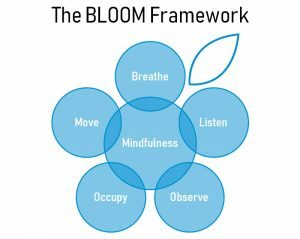 5 “BLOOM” Mindful Modules: Breathe, Listen, Observe, Occupy, Move. Provides variety and interest for your students. Hour 3: Introduction to Mindful Motion – how to use movement to manage stress and anxiety. For more information and to discuss your requirements, please call Darren on 07977 135506.